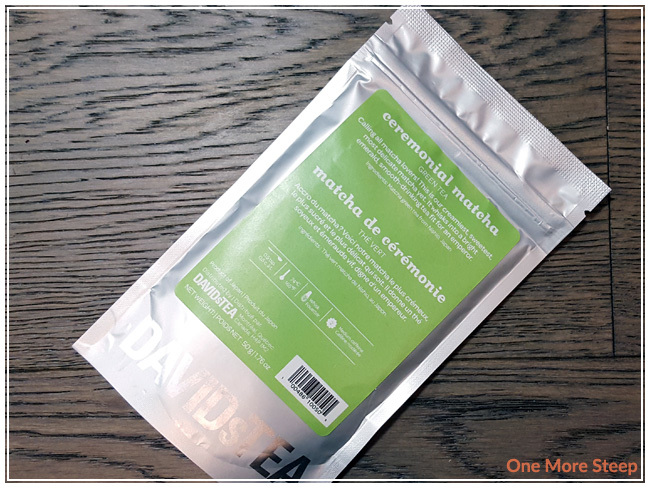 Ceremonial Matcha from DavidsTea came to me in one of their standard resealable silver foil bags. The matcha itself is a bright green, and I can see some clumps of powder in the bag and after I scooped it out – who knows how long it’s been in there for? Ceremonial Matcha is made up of matcha green tea from Nishio, Japan. The aroma from this matcha powder is primarily that of grassy notes to me. 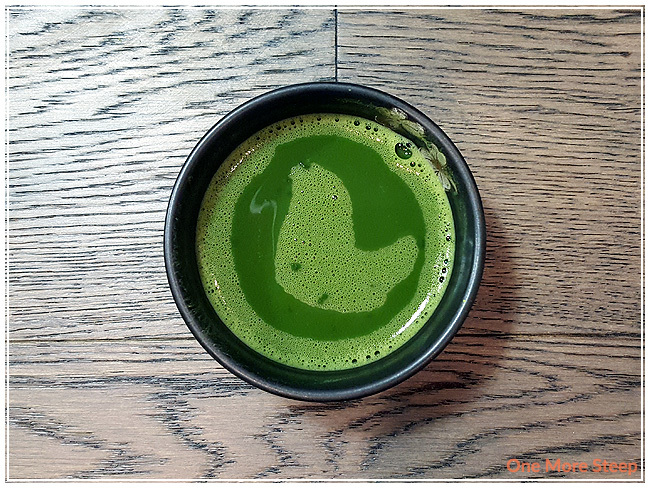 The description suggests that this matcha is creamy, sweet, and delicate. The packaging for Ceremonial Matcha is of their older label style – this one includes an actual temperature guide (74°C/165°F). On the product page online, the temperatures suggested are 167-176°F (75-80°C). Both packaging and online page suggests preparing Ceremonial Matcha with a whisk (their online page also suggests their travel-friendly matcha maker if that is more your style). When preparing Ceremonial Matcha, I sifted the powder into my bowl and then whisked it with a small amount of water that had been heated to 165°F until the powder was mixed in, then added more water until it was thin enough. Ceremonial Matcha whisks to a beautiful bright green that’s on the darker side – it reminds me of emerald green. There’s a slight layer of foam on top from the whisking action. At first sniff, I can smell grassy notes, and a very familiar seaweed smell. 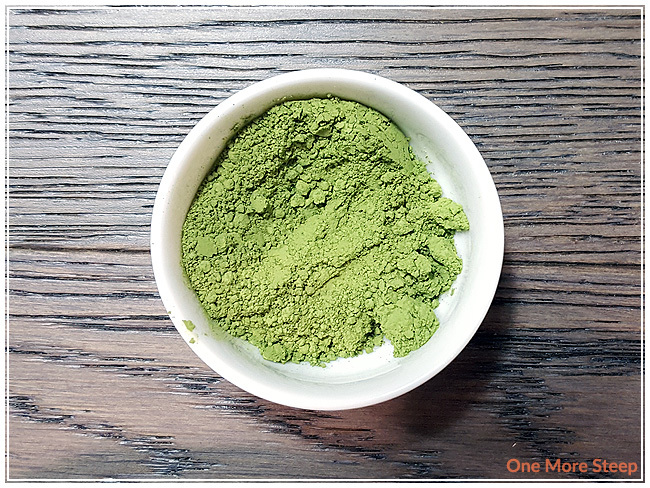 On first taste, the first thing that hits my tastebuds in the umami notes from this matcha. It has a very strong grassy flavour, mixed with the seaweed flavours. I don’t get any sweetness from this matcha, nor do I found it creamy. I wound up adding a bit of agave syrup to it, to help tone down the umami notes, which helped to make to more palatable. Also, turning it into a matcha latte helped a lot as well. 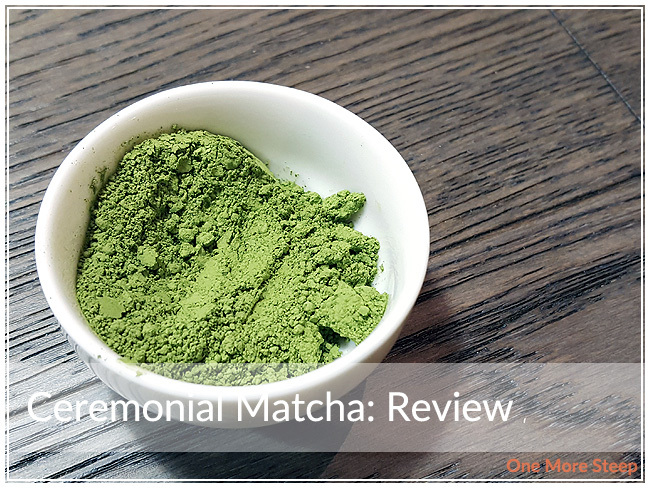 I didn’t like DavidsTea’s Ceremonial Matcha. I really wanted to like this one, but found it was just too strong of the grass and seaweed flavours for me to be enjoyable. In order to finish the cup that I had made, I needed to add a sweetener to it to make it more palatable to my taste buds. I’ve had better matchas before, and since this one is so expensive per gram, I can’t see myself wanting to buy more of it.